It might sound strange to some of my younger readers but believe it or not there once was a time before mobile phones were commonplace. At the risk of sounding ancient I got my first mobile phone in 1996 when I was 18 and I felt like the bees knees. I was one of the first of my friends to own one and I didn't care that it just made phone calls and sent text messages with just words in them, I felt tres sophisticated and way cool. A few weeks ago now I was contacted on behalf of Three Mobile to celebrate the inclusion of Spain in their Feel at Home mobile roaming network plan, and to celebrate I was given the opportunity to bring out my Mediterranean side and to a learn a bit of Spanish. There are so many different language apps available on the Apple App Store that it's hard to know where to start but the lovely people on behalf of Three Mobile provided me with a little bit of guidance and an iTunes voucher to get me started. I downloaded the apps that they recommended which gave me some good grounding because they are all so different. This one is my favourite, no question - why? 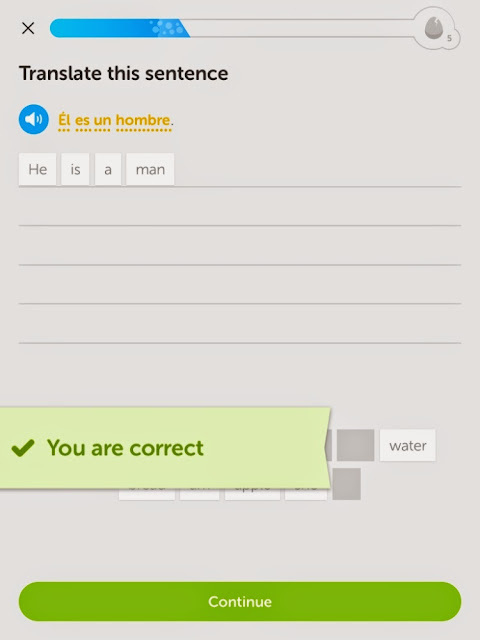 because it makes learning a language fun. 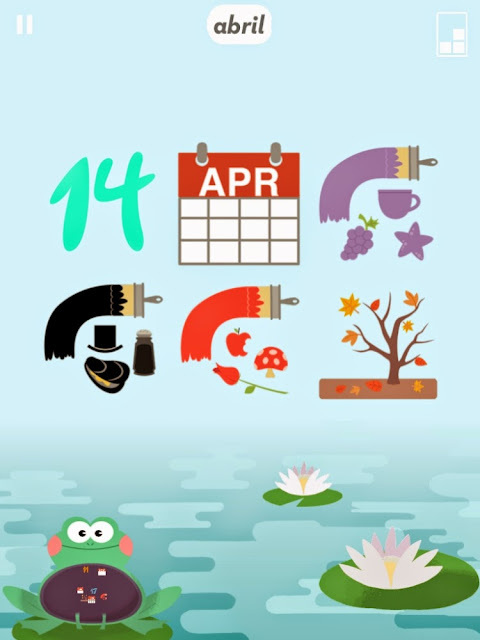 The lessons are split into nice manageable chunks and it's all about (at least in the early stages) learning basic vocabulary, starting off with your basic numbers, days, months, weather, seasons and colours. You learn by reading, looking at the accompanying picture to trigger your memory and by listening to the pronunciation. That doesn't sound that much fun so far but then you get to test your knowledge and your skills by playing games. As your progress through, and master different lessons and perfect your skills you earn XP which unlocks more games. The games in the earliest stages, are Swell where you chose the correct word to stop the water draining from the fish bowl, and Belly which you can see above where you feed the frog by matching both the written and spoken word to the pictures. 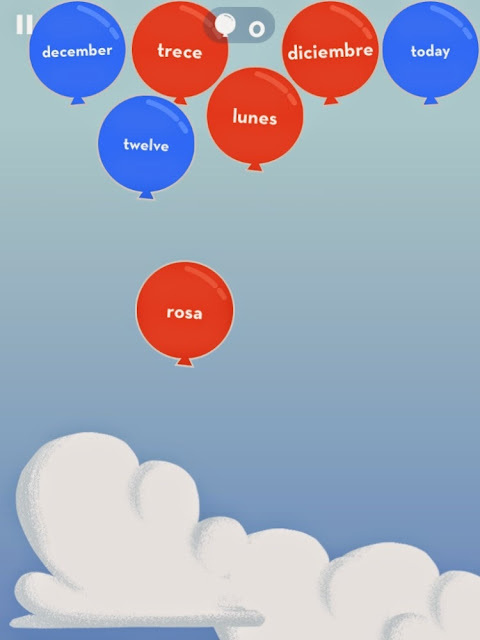 There is also Word Birds which gives you a word in English and you then need to spell the word in Spanish from the given letters and there is also Bloon which is my favourite game so far. It's a bit like Bubble Bobble or any of those bubble bursting games, you need to clear as many of the bubbles as possible by matching up both the English and Spanish words. 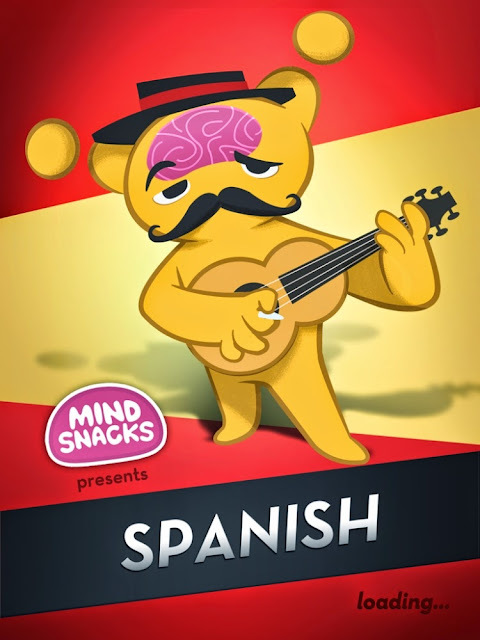 If you have no knowledge of Spanish whatsoever than this is probably the app for you, it's strange how games really help you to absorb some of the information. The spelling game Word Birds is particular tough and it really gets your brain working. My one complaint with this one is that so far there is no option to test your own pronunciation but I have a long way to go so maybe that might come in later. 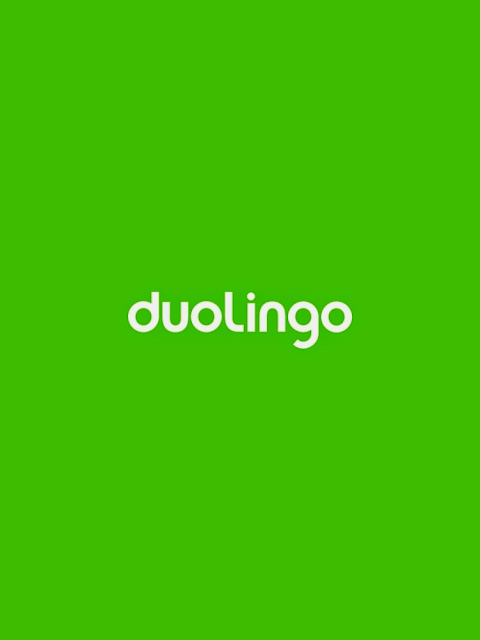 This is another app that I would recommend for beginners, again it guides you through all your basic vocabulary. Again pictures are used as a memory aid and as well as reading the word you can also hear how the word it pronounced. 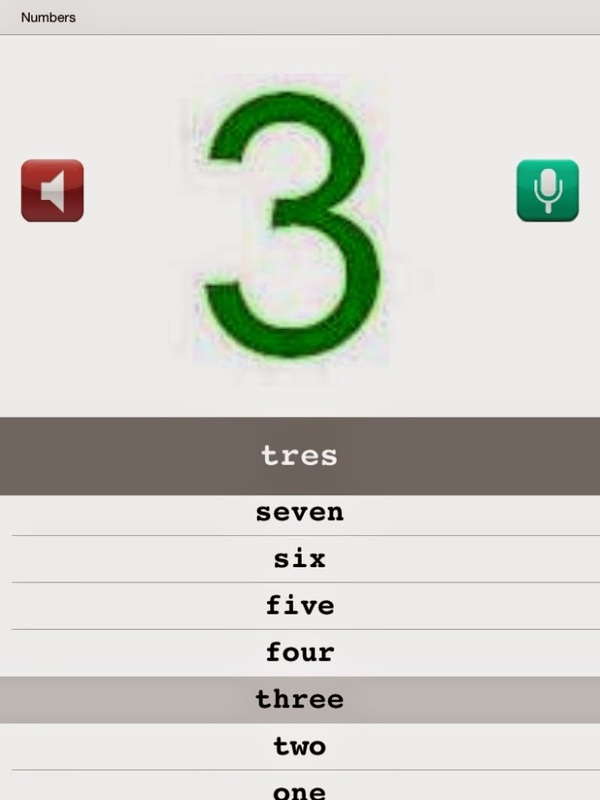 Unlike the previous app though this one give you the opportunity to record your own pronunciation and listen to it back - eek! Once your familiar with the vocabulary you can play games and carry out exercises such as memory games, flash cards, listening exercises, spelling tests and quizzes to help you test your knowledge. It isn't done in quite as fun away as the Mindsnacks but it's easy to use and I like the option to record your own voice. Despite the fact that you can pick how experienced you are for me, this app assumes that you have a little bit of prior knowledge. 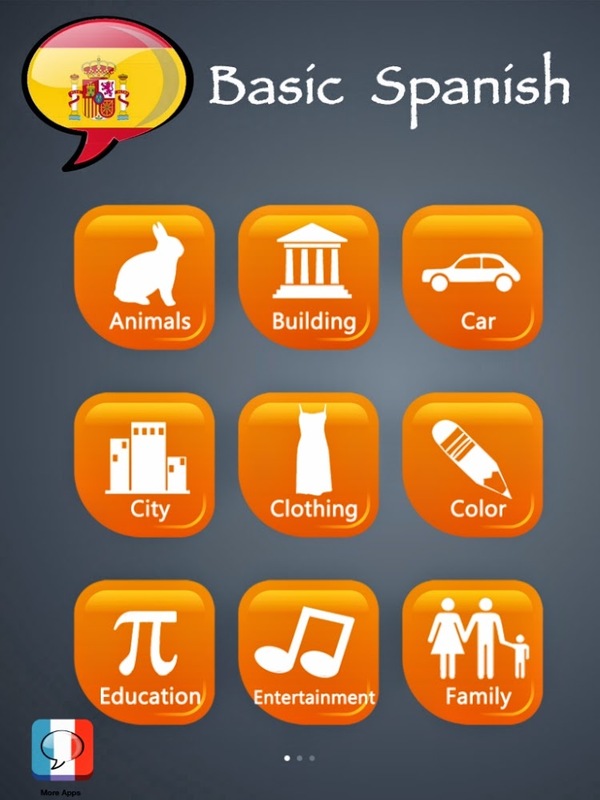 Unlike the other two apps this one doesn't focus on vocabulary instead it focuses on the basics of the Spanish language, and how you use the words that your learning. 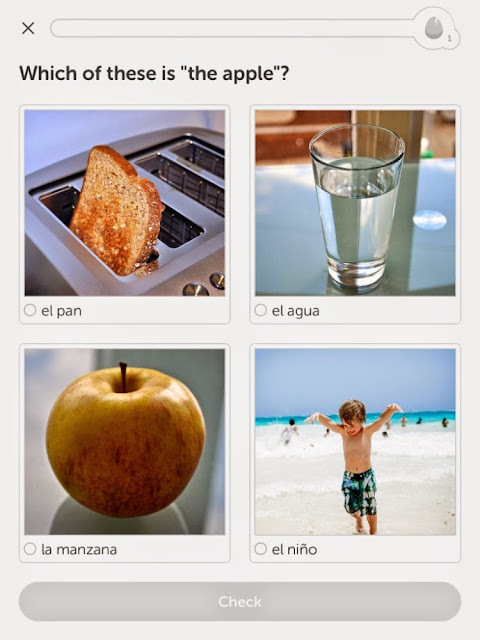 Each lesson goes through a variety of tasks from identifying the correct word and picture, to translating a sentence, typing what you hear, selecting the missing word, and repeating the phrase. Unlike the other two apps that are more about vocabulary this one is actually teaching you words, verbs, and how to use both the masculine and feminine form of words, it's basically teaching you how to speak, spell and construct sentences. It's take me a little while to get to grips with it but after setting my reminders every day to practise I'm starting to feel a bit more confident with it. Okay after a couple of weeks I'm far from fluent and my spelling and pronunciation still leaves a lot to be desired but by spending 10 minutes or so a day playing with the apps, playing games and practising my vocabulary I can definitely say that I know a bit more of the Spanish language than I did three or so weeks ago. All of the screen shots are taken from my iPad for clarity but I've got all of these apps on my iPhone too so I can practise on the go, be it in a hospital waiting room, on even a bus or a train.